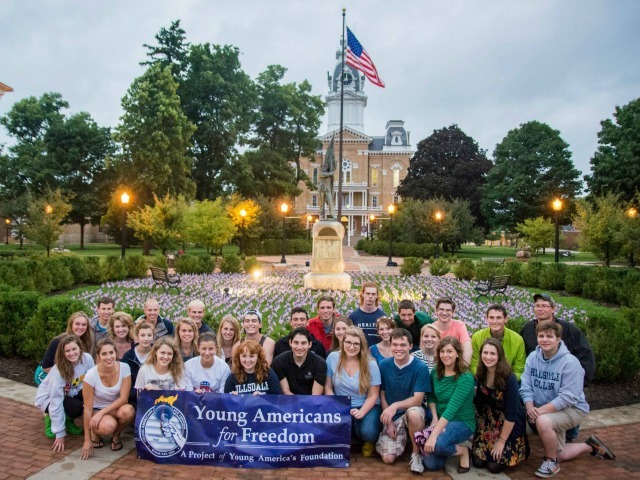 Since 2003, Young America’s Foundation (YAF) has proudly organized the 9/11: Never Forget Project. Through this initiative, students at schools nationwide proudly display 2,997 American flags to remember those murdered at the hands of radical Islamists more than a decade ago. More than 250 campuses will participate in this year’s project, and its popularity continues to increase. The project has even taken a life of its own with schools, businesses, and communities organizing their own displays without notifying us. If it weren’t for the Foundation’s student activists, most schools would ignore the anniversary of September 11. Even more worrisome are the professors who continue to blame America for the attacks. The Obama administration has even tried to change the meaning of 9/11 by turning the anniversary into a politically correct “national day of service.” They would like us–and particularly young people–to forget who murdered nearly 3,000 innocent American men, women, and children. Today marks 13 years since the tragic terror attacks in New York City, Pennsylvania, and Washington, D.C. September 11, 2014 is also the two-year anniversary of the terrorist attacks in Benghazi. Many students in college now were only five years old when the attacks happened, which is why this project is important now more than ever. Young America’s Foundation’s student activists understand the significance of 9/11 and hope to raise awareness about the importance of eradicating terrorism. For more information about the 9/11: Never Forget Project and a list of participating schools, please visit our website.